He became the friend of Princes and Kings who showed off his beauty and also became the inseparable companion of circus performers who used his great intelligence and memory. 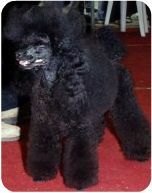 Splendid example of beauty, the poodle is divided according to size: Toy (up to 28 cm), Miniature (from 28 to 35 cm), Standard (from 35 to 45 cm) and Giant (from 45 to 58 cm). His curly or corded coat may be of many colours: black, brown, grey, white, cream and apricot. A well-proportioned dog, with a light and springy gait. 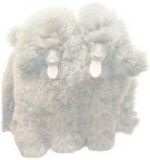 The poodle lives for a long time, must take exercise because tends to fatten and needs accurate grooming. Suitable for living in flats, the poodle has a lively temperament and good character; he is intelligent, active, elegant and proud. He is a good companion and is extremely faithful, he is ready to do anything for his master, and has often shown to be an excellent friend for lonely people.